Founded in 2001, HIKVISION is among the world's leading suppliers of video surveillance systems and solutions. For 14 years, the company quickly developed from a small organization with a staff of 28 people to a global corporation with more than 9500 full-time associates, including 3,000 engineers. Hikvision possess the world's largest R&D team and state-of-art manufacturing facilities; both allow Hikvision’s customers the benefit of world-class products that are designed with cutting-edge technology. As further commitment to its customers, Hikvision annually reinvests 7% of its revenue into R&D for continued product innovation and improvement. HIKVISION product range includes standard and hybrid recorders, video servers, IP cameras with high resolution and speed dome cameras. HIKVISION production is successfully sold in over 100 countries, providing safety and reliability of its users. The company has offices in USA, Holland, Italy, England, Singapore, Australia, Brazil, South Africa, UAE, India, Russia and Hong Kong. For several years, the company ranks in the top places in the world as a manufacturer of equipment for video surveillance and market capitalization of the stock market amounted to 12.1 billion euros. VIKIWAT Ltd. is a distributor of a variety of CCTV HIKVISION. With us you can find or order a variety of moisture-resistant security cameras, dome cameras, digital cameras with high dynamics and more competitive prices and fast delivery. 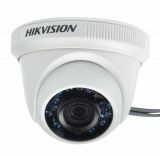 HD camera DS-2CD1301D-I HIKVISION High quality camera for outdoor installation with crystal picture. HD-TVI vari-focal IR turret camera, FullHD 1080P, IP66, 2MP, 1920x1080px, HIKVISION DS-2CE56D1T-IRM is a waterproof camera with infrared illuminator with up to 20 m range. Mechanical IR-cut filter. Aluminium body for indoor and outdoor mounting. Vandal-proof. HD-TVI vari-focal IR turret camera, HD720Р, IP66, 1.3MP, 1280x720px, HIKVISION DS-2CE56C2T-VFIR3. IP66 weatherproof. Smart IR. 1.3 megapixel high-performance CMOS. FullHD vari-focal camera, IP66, 2MP Camera DS-2CE56D0T-IT3F weatherproof. Smart IR. 2 megapixel high-performance CMOS. Standart video compression with high compression ratio. 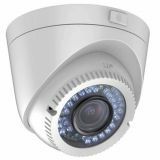 Camera 1Mpx 3.6mm DS-2CE16C0T-IRF HIKVISION High quality, high resolution camera for outdoor installation with crystal clear images both at day and night. Camera 1Mpx 3.6mm DS-2CE56C0T-IRF HIKVISION High quality, high resolution camera for outdoor installation with crystal clear images both at day and night. HD-TVI varifocal IR turret camera, IP66, 1MP, 1280x720px, HIKVISION DS-2CE56COT-IRM is a waterproof camera with infrared technology with up to 20m range. It provides high quality image even in no-light conditions. Mechanical IR-cut filter. Aluminium body suitable for indoor and outdoor mounting. Vandal proof. HD-TVI videocamera, HD 720P, IP66, 1MP, 1280x720px, HIKVISION DS-2CE16COT-IR videocamera. IP66 weatherproof. Smart IR. 1 megapixel high-performance CMOS. HD-TVI vari-focal IR turret camera, FullHD 1080P, IP66, 2MP, 1920x1080px, HIKVISION DS-2CE56D1T-VFIR3. IP66 weatherproof. Smart IR. 2 megapixel high-performance CMOS. FullHD vari-focal camera, IP67, 1.3MP, 1280x960px, HIKVISION The DS-2CD211OF-I is a waterproof camcorder with infrared illumination up to 30 meters. Opportunity to monitor over the Internet. Capture in full darkness. Mechanical infrared filter. Aluminum housing. For external and internal installation. Vandal resistant.